17-day New Zealand photography tour capturing some of the country’s best untouched wilderness and the Te Wahipounamu world heritage area. This tour will be lead with Richard Young along with three other top New Zealand landscape photographers throughout different parts; Rob Brown, Shaun Barnett and Dave Buckton. You will have the opportunity to learn from 4 professional photographers and get to photograph a total of 7 of the country's finest national parks. Starting in Queenstown the tour will first head to Mt Cook National Park to photograph some of the amazing alpine scenery around New Zealand’s highest peak. We will cross back through Central Otago to the South Island’s West Coast. With excellent opportunities to capture the wild beaches of the area, its forests and waterfalls, as well as views of the snow-covered Southern Alps. The South Island’s West Coast boasts more forests, mountains and protected lands than any other region of New Zealand. Here, wild and remote coastlines are flanked by primeval rainforests, with the high peaks and glaciers of the Southern Alps rising beyond. 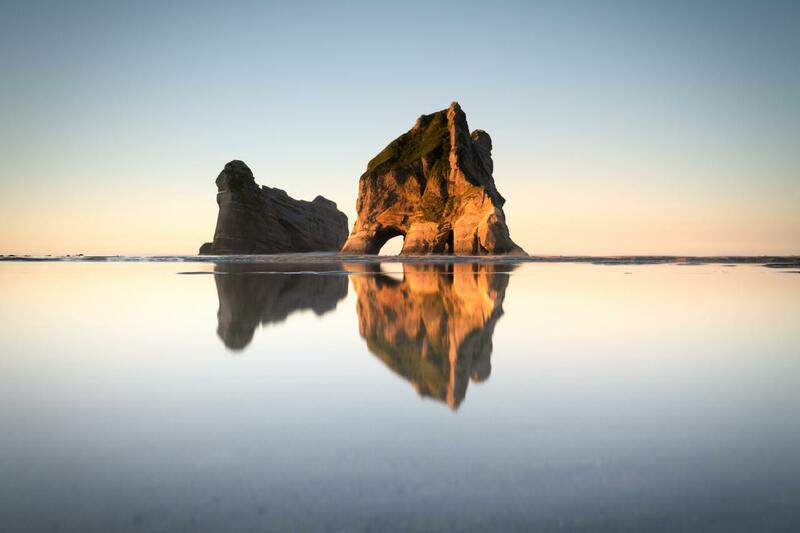 Journeying on to the top of the South Island you will then spend 4 days capturing coastal landscape around Golden Bay, including a full day on a private charter boat in the world famous Abel Tasman National Park. An early morning departure from Queenstown will see us arriving at Mt Cook before lunch. After assembling at Mt Cook Village, our home for the next three nights, we will spend the morning running through an introductory programme for the finer points of working in manual mode and advanced settings for landscape photography, before heading out for an evening shoot in the Tasman Valley. After an early morning sunrise shoot in the Tasman Valley we spend some time reviewing photographs from the previous four days and covering post processing. We will depart Mt Cook after lunch, crossing over Lindis Pass to Wanaka, stopping on the way to capture the tall, tussock-covered mountains here. We will arrive in Wanaka in time for a sunset over a very famous willow tree which sits in the lake here. Today you will have a free day in Wanaka, with the option (at additional cost) of joining one of our tutors on a 4×4 trip across the Wanaka high country, or a pre-dawn heli-flight high into the mountains, landing overlooking Lake Wanaka for the sunrise. Our last chance for a sunrise shoot in Golden Bay. Therefore we will be up early to shoot one of a number of coastal locations before heading back inland over Takaka Hill. We will then make our way back to Nelson to connect with late afternoon flights.